Today GOG added three classics from Impressions to their portfolio! Rome wasn't built in a day. How long will it take you? Hang on to your togas! As governor of a province of the Roman empire, you must build cities, rule wisely, and lead legions to crush hostile barbarian attackers. You'll fortify your creations with mighty walls and towers, keep the plebes happy with baths and entertainment, and keep a careful watch on your defenses. Success will lead to promotion, and your cities will expand to fill your province. Govern well and you may rise to rule the empire as Caesar himself! 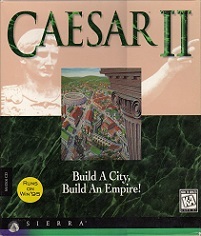 Build Rome in the Ultimate City-Building Simulation! You are the Governor of a Roman province whose capital city (if you build it well!) will become the talk of the Empire. Choose from dozens of authentic structures - temples, aqueducts, bath houses, even the Circus Maximus - and watch your city spring to life. Develop resources, open trade routes and promotion will soon follow. Then expand your territories and move up the ranks. Your challenge - to rise and become the next Caesar - while confronting upstart Gauls, invading barbarians and restless citizens who threaten your eternal cities. Can you do as the Romans did and build the ultimate city? Our People Shall Build You a Great Empire if You Rule Them Wisely. Start with a plot of land by the Yang-Tze and end with the Earth�s mightiest empire. Help your people thrive. Discover new technologies. Set taxes, control trade, raise huge armies. Invade other cities and make them yours. Decorate. Do you have what it takes to build the Great Wall? Will you remember to honor your ancestors? Your throne awaits!